Slide this beauty in to your life now. With it’s ease and grace, it’s a decision that’s already made. 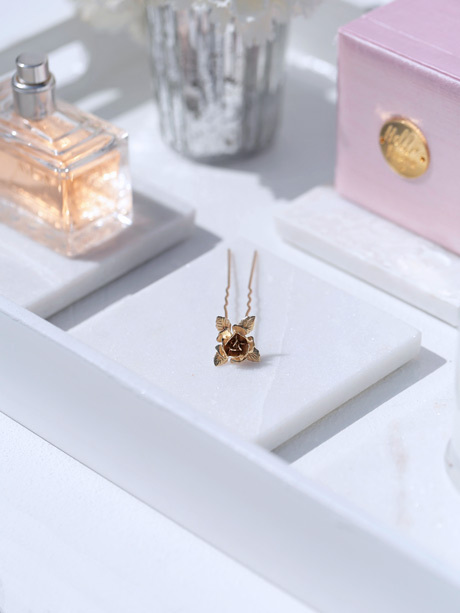 A touch of organic floral with a chic metallic sheen. The Melbourne Hair Comb gives just enough glam to your wedding day. The five rose setting of the Melbourne Hair Comb will slide right in to your wedding look. Or maybe be the perfect accessory to that gorgeous veil. This bridal comb is the love child of our Luxe Melbourne Bridal Tiara. Originally the first creation in the Australia Range. 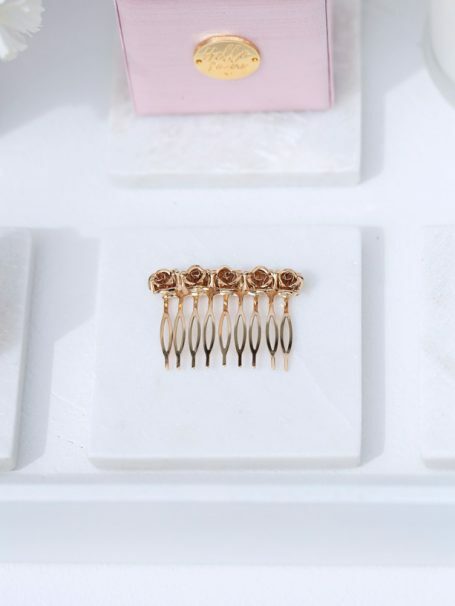 The five rose setting sits on top of a slide comb for ease of wear. This Melbourne chic inspired piece can be a feature in the side of your bridal hairstyle or compliment your gorgeous veil. Size: Flower feature is 1omm wide and 10mm high, comb is 36mm and 50mm across. Your Melbourne hair comb will be arriving at your home in our signature pink silk Hello Lovers box. Consider matching this bridal hairpiece with the equally beautiful Melbourne Wedding Earrings . Or Melbourne Wedding Bracelet. Distinctively unique bridal jewellery made in Australia with love by Hello Lovers. Viewing of this online jewellery collection at Leah S Designs Melbourne bridal shop. This is the only shop in Australia that this collection of wedding jewellery and luxurious lace wedding dresses .can be seen.